Can you picture yourself blowing out a hundred glowing candles on your birthday cake? In September the nation will celebrate National Centenarian Day! What is a Centenarian? Our cherished family members who are 100 years old or older. What is the key to their longevity? At Aegis Living, we have asked our centenarian residents this question over the years, and the answers seem simple. But these 10 tips are important reminders for all of us. How do Centenarians recommend living a long, happy and healthy life? The more, the merrier – Having an active social life that includes close family and plenty of friends. 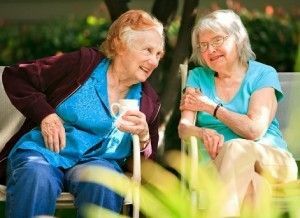 Being a social butterfly can have positive effects on your health and reduce cognitive decline in old age. Move it or lose it – We all know that exercise is important. Being active is something that you need to do throughout your lifetime. Walking, stretching, and getting your blood pumping is good for your stamina, balance, and mental health. Exercise can boost your mood as well as your energy level. Don’t throw caution to the wind – Be prudent about wearing your seatbelt and biking with a helmet. Be cautious when getting up on a ladder, driving in bad weather, or engaging in any activity that may be dangerous. Most risk takers won’t reach 100. A healthy diet – We all know that we should eat a balanced diet, but that is not always easy. Concentrate on portion control and keeping a healthy weight. Eat food that keeps your heart, brain, and bones healthy. Doctor’s visits – See your doctor on a regular basis for routine checkups or when you are ill. By getting the right services, treatments, and screenings, you can improve your chances for a longer life. Don’t abuse tobacco, alcohol, or other substances – But you already know this! A positive attitude – Optimistic people tend to live longer because they are more resistant to stress and tend to lead a healthier lifestyle overall. Optimism is a good predictor of a long life. Let things slide off your back – Try to reduce the stress in your life. Don’t hold grudges. Don’t worry so much. Strive for balance and don’t sweat the small stuff. Meditation can help focus your energy. Be happy – Find joy in life every day. Do things that you enjoy and appreciate. Reading a good book, gardening, hiking a nature trail, hugging your dog, or laughing loudly – enjoyment will give you something to live for. Obviously, there are many more factors to becoming a centenarian, such as genetics, but this list can give you food for thought. If you want to live a long and healthy life, these tips may get you closer to the 100 candles on your birthday cake someday. If you would like to meet a few of our Centenarians visit one of our Aegis Living communities today.